Italy's state lottery has reached a record jackpot of €107 million ($152 million), sending Italians and fellow Europeans on a ticket-buying spree before Tuesday's draw. No one has bet on the winning six-number combination of the SuperEnalotto game since January, setting the stage for what could be Italy's highest-ever lottery prize. The win is only potential because the jackpot would be split if more than one player guessed the right numbers. So far, Italy's largest single lottery prize is the €100 million won in the Sicilian city of Catania last year. 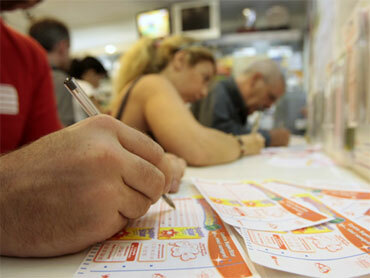 "Everybody is playing," said Alessandro Paterna, an employee at a cafe in downtown Rome that sells lotto tickets. "More and more people hope to solve their economic problems by winning." Hit by recession and rising unemployment amid the global economic crisis, Italians are increasingly dreaming of a wealthy future through lottery games. According to a survey by the Censis social studies institute, the amount spent on the SuperEnalotto has risen steadily in the first six months of 2009, with Italians buying an average of €7.8 million worth of tickets every day. About 45 percent of the income goes to the state. "Everybody loves to dream," said Emanuele Vesci, a 49-year-old businessman buying a ticket at a Rome store. "I never play, but when the jackpot is this high, everybody plays." Large crowds filled lottery kiosks and stores in Rome before Tuesday's draw and Italian media reported the frenzy had spread to visitors from France, Switzerland, Slovenia and other nearby countries. "Many come from abroad to play, mainly French and Germans," said Paola Leonori, who owns a kiosk on the historic Campo de' Fiori piazza. "And the tourists join in on the fun, too."